The Espagne was a paquebot built in 1910 at the Chantiers & Ateliers de Provence of Port-de-Bouc for the Compagnie générale transatlantique. When it was put in service in October 1910 on the Mexico route it was the biggest of the CGT on this route. From 1912 to 1915, the ship served on the Le Havre-New York route, then Bordeaux-New York. From 1916, the Espagne was requisitioned by the Marine nationale (navy) and became a troop transport. 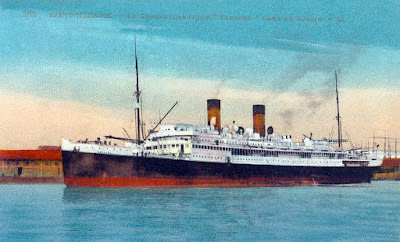 In 1920, the Espagne returned to service between Saint-Nazaire and Mexico. Decommissioned in 1932, she was broken up in 1934 at Saint-Nazaire.